Better plans and more data are needed to guide response. 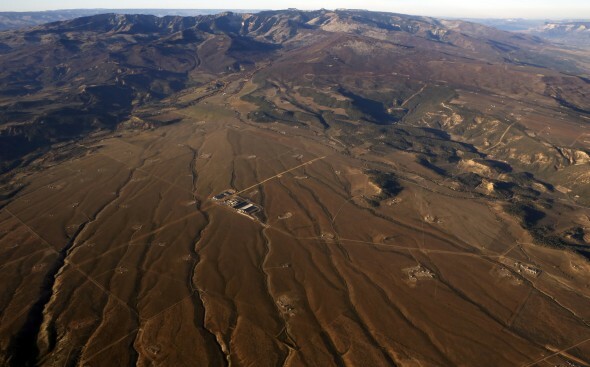 Natural gas wells dot the landscape in Garfield County, in northwest Colorado. Energy is the theme of the first of four drought meetings this fall hosted by the Western Governors’ Association, a forum for state leaders. Click image to enlarge. In the midst of a record-smashing dry cycle in the United States, the organization with the most influence over state and federal drought policy wants to do a better job managing the crisis. The need is evident. New research indicates that current state drought plans are inadequate for the task. On September 18 and 19, the Western Governors’ Association, a forum for state leaders, will welcome to Norman, Oklahoma, agency officials, industry representatives, and technical experts who will offer insight on how a multi-year drought in the western United States is challenging the energy sector. Subsequent two-day events held over the next three months will look at effects on mining, agriculture, and water supplies. The meetings, an initiative of Nevada Governor Brian Sandoval, the new WGA chairman, are timely and urgent for three reasons. First is the severity of recent droughts. California’s major reservoirs are less than 30 percent full and groundwater tables are at all-time lows, after three years of scant rain and snow. The seven states of the Colorado River basin, enduring the driest 14-year period on record, have agreed to unprecedented water-saving measures, to boost reservoirs and protect hydropower generation. Still reeling from its driest year ever in 2011, Texas has not seen its reservoirs recover, while high-growth cities and mushrooming oil and gas production compete for scarce water supplies. Since 2011, drought and heat waves contributed to $US 52 billion in economic losses in states from the Ohio River basin to the Pacific coast. Rafts don’t float on dusty river beds, cows can’t graze on barren pastures, and farmers can’t sow hardened fields. Today, thirteen of the 19 states in the WGA are unusually dry, according to the U.S. Drought Monitor, a weekly scorecard. The second reason the meetings are important is the poor track record of state drought plans. Plans usually come with two sets of measurements, according to a study published this summer in the Bulletin of the American Meteorological Society. “Indicators” gauge the onset and depth of a drought. “Triggers” set thresholds for official action. Yet plans are often ignored. Of the 18 WGA member states with drought plans, only two states use the indicators and just one reacts to the triggers, according to the study by Anne Steinemann, a researcher at the Scripps Institution of Oceanography. “We got some emergency funding [to develop a plan], so we held a workshop. But we haven’t really used the plan,” said one state drought manager, in comments that were published in the study without attribution. Better hydrological data and communication between local groups and state officials would soften drought’s punch, the managers said. They estimated that improved early-warning systems could reduce economic costs by 33 percent on average. The third reason the meetings matter is the sway that the WGA has over state and federal drought policy. Founded in 1984, the WGA brings together the leaders of the driest states in the union. White House officials frequently attend t he organization’s annual meetings. The WGA played a central role in passing federal legislation in 2006 that created the National Integrated Drought Information System, which provides the sort of early-warning detection and data dissemination that drought managers deem so vital. Its sister organization, the Western States Water Council, successfully lobbied for the addition of water-tracking instruments on the Landsat 8 satellite mission, which launched in 2013. Yet as the governors’ forum kicks off this week in Norman, new challenges have emerged. With more people and more users, the tightening of water supplies cuts deeper than before. As the atmosphere accumulates more heat-trapping gases, future droughts will likely be even more severe. And austere budgets at the state and federal level have whittled climate monitoring and data collection systems, the core of any effective drought response, to the bone. “Everyone is looking at each other asking who is going to be the steward for the monitoring systems,” Mike Crimmins, a University of Arizona climatologist and a member of the Arizona drought monitoring committee, told Circle of Blue. An immediate shift in course will not be coming. Joe Rassenfoss, WGA spokesman, told Circle of Blue that though the drought forum is a venue for sharing ideas, no broad policy changes would be announced. Nonetheless, drought will remain in the spotlight. It is the focus of Gov. Sandoval’s year-long chairman’s initiative, which lasts through June.